The attention to detail, Consistent quality construction has distinguished maxpedition. Rightly so, We often get orders from soldiers in the field looking for their items. To meet the demanding application they have in mind. We agree that these products are made for the long haul. 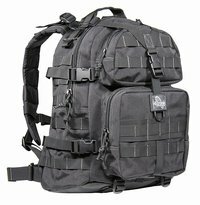 Battlefied tested features include: -Dimensions: 17.5"(H) x 14"(W) x 6.5"(D) Main Compartment -5.5"(H) x 9"(W) x 2"(D) Upper Front Pouch -8"(H) x 9"(W) x 2.5"(D) Lower Front Pouch -Overall Capacity: 1950 cu. in. / 32 L -Hydration: Fits up to 100 oz / 3L Reservoir -Support: 1" Sternum Strap, 1.5" Waist Strap -Optional accessories: Hook & Loop Modular A-ccessories and Grimloc Carabiner FREE SHIPPING FOR CONTINENTAL US & TERRITORIES. INTERNATIONAL SHIPMENTS WILL BE CHARGED SEPARATELY.